The Jacoby family came from Loebau, Prussia, a territory of Poland then controlled by Prussia. They arrived in the United States at different times during the 1870’s. Five brothers settled in Los Angeles: Isaac, Nathan, Charles, Abraham, and Lessor. Another brother, Herman, also came to California but settled in Wilmington as Postmaster. 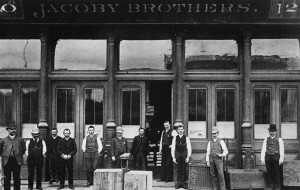 The five Jacoby brothers started business in Los Angeles in 1878, joining with Leopold Harris and buying out Herman W. Hellman’s store. Hellman left after 5 years, at which time the firm became The Jacoby Brothers and flourished well into the first third of the 20th century. Jacoby Bros. sold a full line of clothing, furnishing goods, boots, shoes, hats, etc. 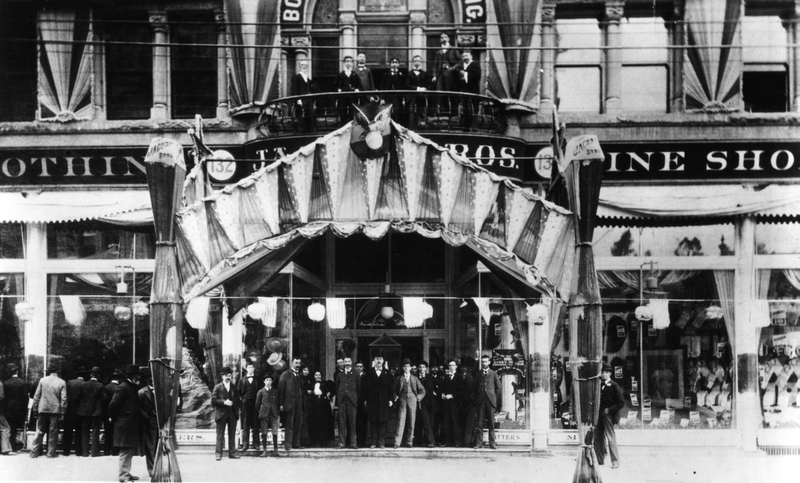 Their business was operated at both wholesale and retail levels, with three traveling salesmen and thirty salesmen in the store. The business quickly expand to larger and larger locations, both for wholesale and retail. Jacoby Bros. became one of the largest retail and wholesale companies in Los Angeles. Courtesy and accommodation were their trademarks. In the early-1930’s, it sold out to David May of the May Company in St. Louis. This occurred after Hamburgers Department Store was also sold to the May Co. in the mid-1920s. Abraham Jacoby was involved with the Los Angeles Merchant’s Association in 1885 and 1886. He played a major part in the creation of La Festa de Los Angeles [click here] at the turn of last century. 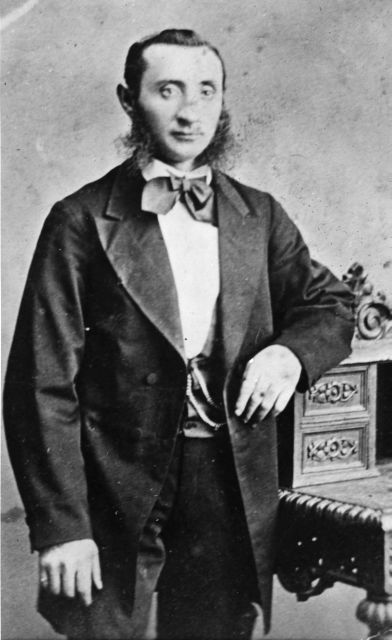 In 1870, Charles Jacoby was Director of the Los Angeles Social Club. One of their clerks, Henry K. Sienkiewicz, in later years was the author of the novel, Quo Vadis. “Jacoby Brothers of Los Angeles,” Western States Jewish Historical Quarterly 7/4. “Jacoby Brothers of Los Angeles, A Self-portrait, 1888,” Western States Jewish History 38/3&4. William M. Kramer, “Jacoby Brothers Clothiers,” Western States Jewish History 42/2&3.